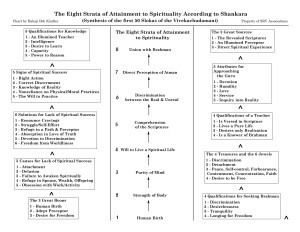 These points can be found and/or inferred in verses 8 – 10 of the Vivekachudamani. 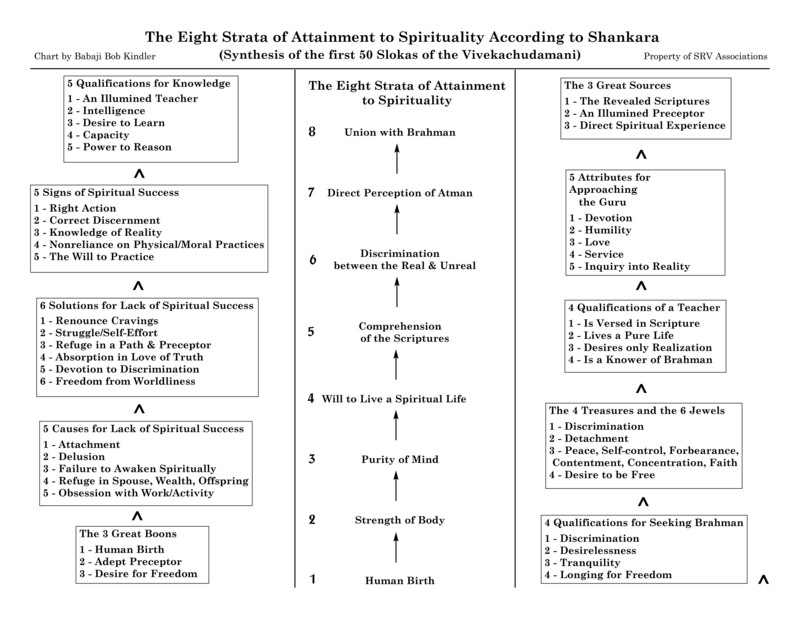 In Part 7 of this series we completed the “Five Causes for Lack of Spiritual Success” found in verses 4 – 7 of the Vivekachudamani and highlighted in the chart “The Eight Strata of Attainment to Spirituality According to Shankara.” (see chart at bottom) Now we will take up Shankara’s next series of points that can be classed as solutions for lack of spiritual success. In today’s world, one rarely hears anyone lament over a lack of progress in spiritual life. Instead, one is more likely to hear people complain about work and lack of advancement, lack of enthusiasm, lack of sufficient earnings, lack of free time. The goal of work-life is probably more obvious to people because it is tied in to their desires for pleasure in the world and avoidance of suffering. But spiritual life – a life engaged in spiritual disciplines and which accepts God/Self-Realization as the goal of life – often arises from recognition that the world itself is unable to give real satisfaction. It may come for a while, but then a new desire or source of suffering emerges. It is like trying to eliminate brush fires during high winds. Put one out and it springs up elsewhere. There is no rest from desires as long as one tries to fulfill them in the world. The traditional teaching about this is called the Four Fruits of Life: Dharma, Artha, Kama, and Moksha. Artha is the acquisition of wealth by legitimate means and kama is the satisfaction of legitimate desires. Without dharma, an authentic spiritual life, gaining wealth and attempting to satisfy desires fastens one to the wheel of samsara, lifetimes lived in ignorance of one’s true nature. Even moral and ethical persons are stuck in rounds of birth, life, death, heaven with their ancestors, and rebirth. Only by placing dharma first does one mature and transcend cravings for pleasure in external things and approach the gates of Moksha, realization of one’s ever-free Soul/Atman. We have just crossed over Navaratri and Diwali when the Divine Mother in the forms of Durga and Kali are accorded special worship. They are warrior Goddesses of transformation and Wisdom who wage war against ignorance. Every weapon they hold is to cut, pierce, shield, and otherwise destroy those factors in the mind that delude human beings. Together, Sri Durga and Sri Kali destroyed Raktabija, the demon who could replicate himself from a drop of blood spilled on the ground. Due to this ability, he and Goddess Durga had been warring for millennia. Sri Durga then emanated Kali from Her Wisdom eye, and instructed Goddess Kali to use Her great tongue to consume his blood before it could fall to the ground. What an image! Raktabija represents the desire-ridden ego that is never satiated and is cunning, bewitching the undiscerning soul with one desire after another, which are ultimately futile pursuits. The Divine Mother in Her twin forms dispatches Raktabija and, like all “demons” that She kills/transforms, he takes his place with the devotees and seers of Truth who have surrendered their limited ego-self into the limitless Self and smiles blissfully on Her Mundamala, necklace of heads. From the standpoint of a seer of Truth, the need to renounce cravings is supremely obvious, for they see the world for what it is, a series of projections over Brahman, the Immutable Reality. Who would want to cling to unreal things and situations and delay the bliss of Self-Realization? Thus, it is essential that spiritual aspirants cultivate an understanding of the state of unending bliss and Awareness that the Seers have realized. Without an intellectual understanding, and faith in the words of the Guru, why will we struggle for it? It is for this reason that the Seers tell us to hold before our minds at all times the goal to be attained, and to have great love and devotion for It. For a rare few, hearing “God alone is Real and the world is false” (a dream, an appearance, projection, or noneternal) is enough to make them renounce the world immediately and by sheer force of will make all thoughts and actions align with that truth. Others have to do this in stages. Two keys for developing the capacity to renounce cravings for pleasure are: one, discern the difference between those desires that lead Godward and those that distract one from thoughts of God/Reality and spiritual practice; and two, contemplate deeply on the teachings concerning the unreal nature of phenomena such as in the Vivekachudamani, and as given above in the yogic rules pertaining to objects. Concerning the first key, it often happens in the early and mid-stages of spiritual life that at the time of study, meditation, or worship (which focuses the mind on Reality), when the mind becomes more and more concentrated, suddenly, like a stray bullet, comes distracting thoughts. “Oh, it must be time for breakfast,” or “so and so must have emailed their reply now,” or, “the birds are singing” – these are the “Raktabija-ego’s” method of preventing the mind from transcending its identification with the external world and remaining the center of one’s attention. Spiritual life depends on one’s ability to concentrate the mind. The word “craving” indicates that we are not in control of the arising of desire, that the impulse comes unbidden from some hidden origin. This craving for pleasure in external things shows up in the inability to keep the senses and mind from going outward. Swami Aseshanandaji would often speak about “vashana samskaras.” Vashanas are desires and samskaras are subtle impressions or residues from past lives. They are part of the chitta, the stuff of the mind, and are only attenuated via spiritual practices that neutralize karma, prevent new karmas, and render the mind peaceful. The practice of repetition of the mantra given in sacred ceremony by one’s Guru is one of those practices, as are daily practices of scriptural study and memorization, concentration and meditation – all with the guidance of the Guru. As my Guru Babaji has recently been stating in classes, do not practice spiritual disciplines with the hope to gain “experiences,” but rather, do them sincerely as offerings, as “divine preoccupations.” The results, for those who pay attention, appear in daily life, such as peace, and insight into the reality of the Self and the unreality of external things. In the next post we will examine Solution #2, spiritual struggle and self-effort. Creation by Local or Global mind?